These feelings he was describing weren’t feelings for any of the women in the room. These were feelings within himself. Anger, sadness, joy, fear, love. Sitting in his meditation, this tough guy learned to be with this feelings. For the first time in his life he learned to feel, to breathe, and to sit quietly. For the first time in his life, he began to feel strong. So, what do these feelings do for a man who meditates? How do they make him stronger? Meditation teaches men to face their fears. Men have been taught to suppress their feelings. Feelings are to be feared. Emotions are equated with being feminine, which men have been taught to see as weak. So, what do men typically do when they feel emotions? They tell themselves to “man up.” While they man up, they push feelings down. They drown them down with alcohol, they tune them out in front of the tv, they bury them under stacks of work. Men will do almost anything to avoid feeling. But emotions don’t disappear. Feelings don’t flee. They fester. They grow. They lash out when a man is least prepared to deal with them. They burst forth in the form of verbal and physical abuse inflicted on wives and children. They break out in the form of road rage. They leave destruction and sorrow in their wake. A strong man, a true warrior, knows that if he can face his fears, he is free of them. If he can sit with those feelings and feel them in the challenging arena of meditation, then he is protecting himself and those he loves from his shadow. It is through sitting in vulnerable silence that men can reclaim their manhood. It is in the stillness of meditation that men can learn to love themselves. Only when they truly love themselves–weaknesses and all–will men be able to love their wives, their children, and their communities with the type of love that is required. 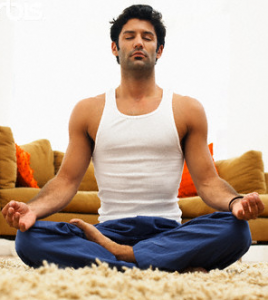 Meditation builds manhood. It is through meditation that a man transmutes fear into courage. It is through meditation that a man transforms anger into fierceness. It is through meditation that a man becomes capable of love.